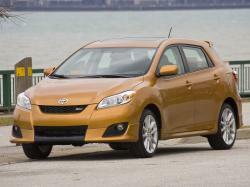 Correct Wheel Sizes, PCD, Offset, Rims and Tire specs for Toyota Matrix series. Your 2009 Toyota Martix fitment guide indicates that the bolt pattern for a 2009 toyota matrix "all trim " is 5x100 well i have a 2009 toyota matrix wit a bolt circle of 5X 114.3 mm so your information is incomplete. 2003-2008 Matrix NOT available with 2.4l engine. The base and XR models came with a 1.8l, the XRS came with a different 1.8l engine. Question. Looking at used rims and snows for a 2009 Matrix xrs. The rims have a 64.1 bore profile and the specs on the matrix say it's 60.1. Should I move on and not purchase? Otherwise the rims/tires fit. 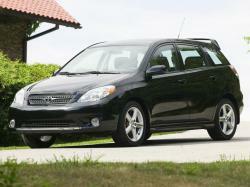 Anyone know if 15 inch corolla steel wheels will fit a 1st gen 2003-2008 matrix? Looking to drop down to 15 inch steelies for my winters. Thanks! Hi,Mark,For matrix wheel,the bolt pattern is 5*100 ,but for corolla,The bolt pattern have two edtion 4*100 and 5*114.3,But both can't fit for matrix. Are you sure? According to this website they're both 5 x 100 for the north american version. Hi,Mark,For north american version,The bolt pattern is 5*100,It is different from other versions. So, to answer my original question, the 15s should fit? haha. my 2014 matrix has 205-55R16 tires. Can i buy a different size winter rim and tire that will fit? Hi,Cal,You can do it.but you need to make sure both new wheels and tires compatible with your old one.